Due to lack of government subsidized education, families face enormous challenges to educate their children. Kamukama Foundation sponsors provide an education to children growing up in extreme poverty who would not otherwise have the opportunity. Just $25.00 a month gives a child the chance to break the cycle of poverty and spark hope for the future. 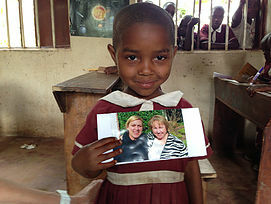 A few years ago my friend Sally told me about a foundation her sister Jeanne had started following a visit to Uganda. That was my introduction to the Kamukama Foundation. 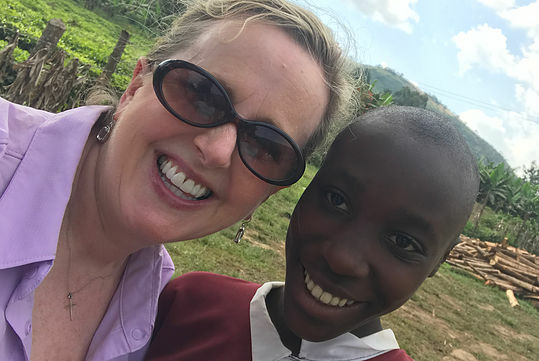 And they, in turn, introduced me to Donamu Nyinansekuye, a student at Victory School in Buhoma, a small village near the Bwindi Impenetrable Forest in southeastern Uganda. Donamu is the smart, beautiful girl I’m privileged to sponsor. Over the last few years I have exchanged letters with Donamu and have been the recipient of several wonderful handmade gifts from her family. I also loved reading about the great work the foundation was doing in conjunction with Victory School. But that was the extent of my involvement—a small charge to my credit card each month and a letter I would write to Donamu once a year. Visiting the school, meeting Victor, the director, and his wife, Sylvia, seeing the beautiful faces of the children, watching the dedication of the teachers, and getting a sweet hug from Donamu are experiences I’ll never forget. The teachers and children welcomed me so generously, even putting on a show with songs and traditional dances. Although I will say they failed miserably in teaching me one of the dances. Of course that probably had a lot more to do with my complete lack of coordination than with their teaching ability, but it was definitely fun trying! And the pride they had in showing off their test scores made me proud to be a small part of this. I’m grateful I had the opportunity to see first-hand the work being done by the foundation and the school. And it made me want to do more. My visit was a lovely reminder that you get out of something what you put into it. I’m not saying that sponsoring a child or making a donation isn’t enough, it’s a big thing that makes a significant difference. But there’s so much more we can all do. We can’t all travel to Uganda, but we can share our stories and bring more people into this circle. In addition to the great work being done at the Victory School, I also got to see the reality of daily life in that part of Uganda. What I saw was that there are still too many children who don’t receive adequate nutrition and too many children who don’t have the opportunity to go to school. I know that the Kamukama Foundation wants to change that, and I’m looking forward to being a part of it. During our first visit to Uganda in the summer of 2012, we had just returned to our lodge following what can only be described as a long, difficult but thrilling hike to see the mountain gorillas. My wife Carol and I were tired and wanted only a hot shower, a little dinner and our beds! However, we learned when we returned that a small group of young children from a local school, joined by a few of their teachers, had been waiting for hours to sing and dance for us. We of course joined others who were staying at the lodge to watch the children. It was a cool, damp night. Many of the children didn’t have shoes or sweaters, most of them looked hungry and we were later told that they had many miles to go to return home in the dark. To say our life changed that night is an understatement. I soon found myself dancing to their native beats. We loved their songs and their dancing but most of all their huge smiles and their longing to connect to these strangers from some other land. 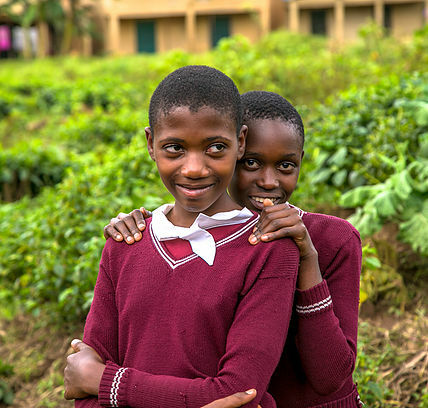 Carol and I knew that we wanted to do something for this fledging school that was struggling to support the poorest of the poor children in Bwindi. After visiting with the manager of the camp about our interest in the school – Victory School – we offered to sponsor two children. Preparing ourselves for what we assumed could be a large financial commitment, we were humbled to learn that it would only cost $125 per year per child. Fortunately, our involvement with Victory School soon became so much greater and we were able to participate in the founding of the Kamukama Foundation. Thanks to the KKF and its successful sponsorship program, what was once 32 children attending Victory School has grown to 300. All of the children are now sponsored, receive 2 meals a day with protein, have uniforms, socks, shoes & sweaters and attend a school with new school books, quality teachers and experienced leadership. In addition, over 60 children have graduated from Victory School and now attend one of the secondary schools in the region, their attendance still possible due to the support of KKF sponsorship. That is the case with Gideon Muhwezi, the young man that we have now sponsored for 5 years. We have watched Gideon go from striving to thriving. We have met Gideon’s only real family, his grandfather, and have seen how important it is to him that Gideon continue his education. This past February, we were able to meet with Gideon at his secondary school and were taken by how much he has matured. There is a light on inside of him that we did not see when we first met him. We look forward to the future unfolding in remarkable ways for this bright young man. Ways that were previously not available to Gideon and the other children but that are now because you all have asked how we can make a difference in the lives of these children and their families. Thank you all for your support of Kamukama Foundation and all of its efforts. The Kamukama Foundation partners with local primary and secondary schools to improve the infrastructure and quality of education. 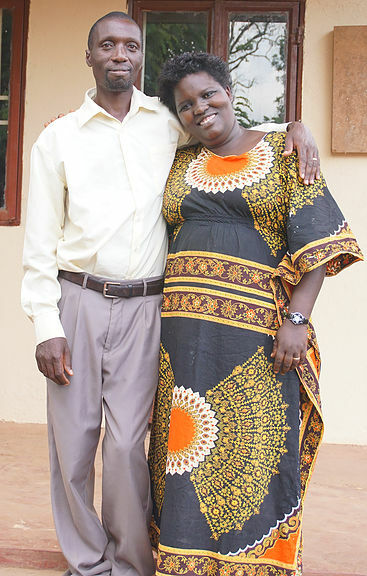 Sylvia and Victor Bahati started Victory School in 2006. Having known poverty firsthand, they sought out a way to positively impact the children in the community. Their mission was to provide an education to the most vulnerable children. Funded from money saved by working at a local lodge the school enrolled 33 children and has since grown to 300. 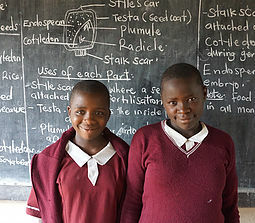 The Kamukama Foundation has partnered with Victory School since 2012 and provides sponsorships for hundreds of students. 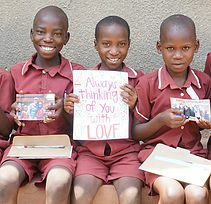 In addition donations have bought textbooks, school supplies, trained teachers, created dormitories and much more. The educational outcomes have dramatically improved for Victory School. 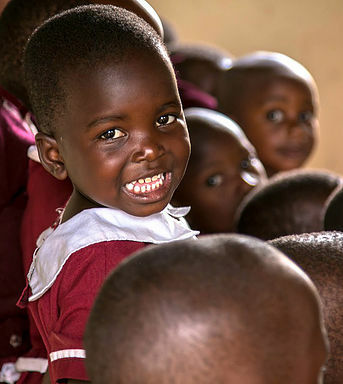 With a young adult unemployment rate of 64% in Uganda, Kamukama Foundation is committed to expanding our outreach to support the educational needs of more children. Looking forward, we will broaden our vision to encompass not only educational support, but also the spiritual, emotional, and physical well being of both primary and secondary students. By taking a more holistic approach, we hope to offer these otherwise disadvantaged youth “opportunities and resources” to become well rounded young adults, equipped with the tools necessary to tackle their futures with great success.